Like I said, this is the issue with the consequences of the Movement’s actions come back to bit them. We’ve seen them take down a lot of opponents in their short arc, such as corrupt police officers, storming the police HQ, interfering with the big businesses in the city and so on. This time, everything hits home because the world is essentially sick of the Movement and its actions and wants revenge, pure and simple. And Gail doesn’t shy away from all that entails. We get to see these events unfold up close and personal, which is just as it should be. 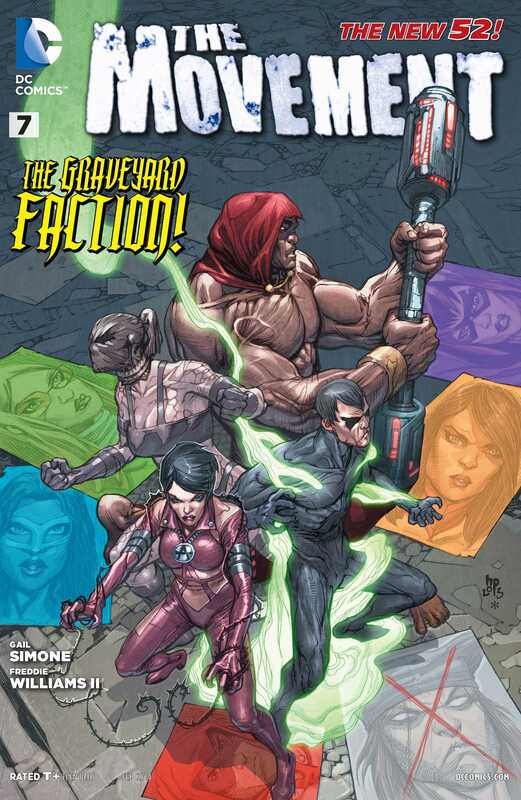 In this issue, the Graveyard Faction takes the fight directly to the Movement and its headquarters in the city, trying to hit them in the one place that the team is truly powerless to do all that much. The execution of how the Graveyard Faction lays out its plan is truly amazing and it all boils down to them hitting the team in its weak spots. With all that Mouse has undergone in recent issues, there’s definitely a lot of violence involved and making the strike on the team’s behalf is Vengeance Moth, a very Oracle-esque figure who is one of the team’s core members and a super-powered individual in her own right, despite being wheelchair-ridden and suffering from muscular dystrophy. She is the character who gets to shine in this issue and Gail writes a really strong action sequence for her while Freddie draws it with his traditional style and supreme attention to detail so that you get the full experience of it all. There are a lot of storylines going on in this issue. We have the Cornea Killer’s daddy issues which hint at a really, really dark past for him. We have the subplot involving the two officers that the Movement held hostage and held a publicised trial for from their base (some great moments here for Officer Yee who finally grows a backbone!). We have the subplot involving the police chief tacitly helping the Movement to clear out his department. We have the subplot involving Burden’s exorcism so that he is no longer possessed by a demon. The latter is turned around on its head and it proves to be an excellent cliffhanger for the issue, one of the best in the series yet and that’s saying something considering how consistent Gail Simone has been. Story-wise, if there’s anything lacking here, its that the Graveyard Faction is not characterised all that deeply and each member of this mercenary team just comes across as a sort of cliche. There is little depth to them and that’s one area where I want the series to develop significantly. Freddie Williams’ art retains its trademark style and given all the different characters and situations that he has to work with here, he does a pretty amazing job. His fight scenes are all extremely brutal and on the bloody side. There really isn’t any other comic by DC right now where the violence is so dramatic, so realistic even. He’s not above giving you a really bloody scene in every issue and the way that he does things here kind of remind me Superman and Doomsday’s epic fight for that first time, where the two trade blows until they are both dead. There’s a raw ferocity in Freddie’s action scenes and its a strength of the series. Chris Sotomayor does an excellent job with the colours once again, staying true to the characters as we’ve seen them thus far and he doesn’t make any missteps. Overall, highly entertaining and an issue that bounces back considerably from the slight slump of last month’s issue. Great to see that the slump was just a minor blip on the radar. More The Movement: #1, #2-3, #4, #5., #6. Posted on December 6, 2013, in Comics Reviews, Review Central and tagged Chris Sotomayor, Comics, Comics Review, DC Comics, Freddie Williams II, Gail Simone, New 52, Review, Review Central, Superheroes, The Movement, Vigilantism. Bookmark the permalink. 6 Comments.